Size : 6x6 & 135 slides. Subject : Nîmes-Garons: O Happy Days! This Monday, the sixth and last prototype of Aircraft Pictorial is coming, now definitively INTERNATIONAL. The reason ? If my collection results from a number of reports exclusively devoted to aviation sites in France, two times I visited the Farnborough Display and I lived some ten mythic Le Bourget Airshows and all this gave a great number of French aircraft pictures, it was the less I could do, but also of all materials that the foreign aeronautical world had to exhibit through this formidable Parisian Showroom. Next, between 91 and 95 I had three more Paris Air Shows to produce kilometers of video tape and also take a few pictures, as a Sunday amateur, with a little camera from a top manufacturer but with a deceiving lens. As I often tell to many young aircraft enthusiasts " sure the quality of a picture has an importance but, before all, had in mind that the aircraft you are picturing, and possibly giving mediocre results when enlarged, have to become, after years, pieces of aeronautical history because your photographs exist and surely not the aircraft, except a very few of them in museums or maintained in flying condition at considerably high costs to be scarcely exhibited ". 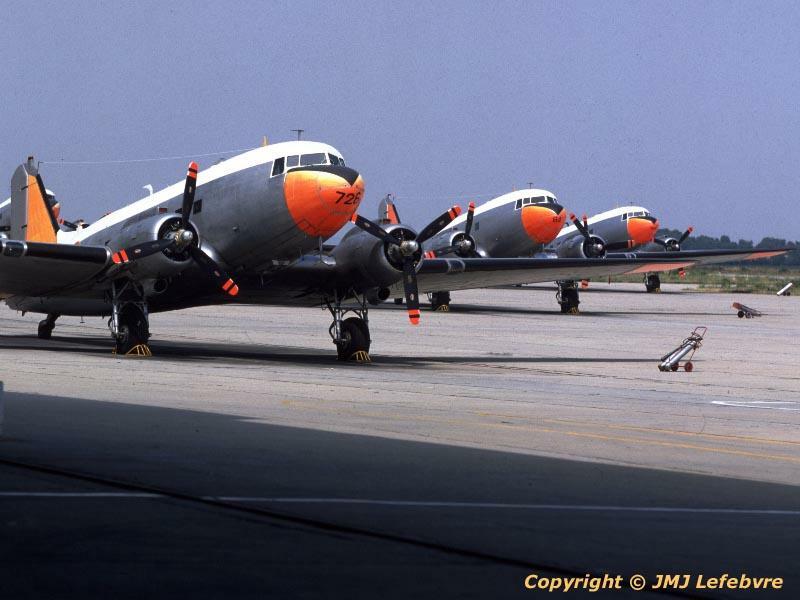 It's the case for the C-47s of Escadrille de Servitude 56S, a unit then producing with their ageing but attractive machines all flying specialists and also flight controllers, but no pilots nor helicopter personals, destined to the French Aéronavale. In July 1981, when delivering their 6000th specialist's badge, their Dakotas were about to be replaced by Nord 262 class rooms which undoubtably would not provide the considerable success encountered by crews with their C-47s when visiting all Western Europe countries, as far as Polar Circle...and all Mediterranean Allied cities. During navigation with a light aircraft, if you were permitted to fly over the Nîmes Garons NAS, you had the fantastic vision of a parking full of C-47s, Bréguet Alizés and Atlantics and, with some luck, a dozen of detached Super Etendards and the same with Crusaders going to train here to deck landings, thanks to a deck-landing lights device and arrester materials, before joining carrier at sea for a new campaign. One or two visiting Neptunes and Fouga Zephyrs might add to your intense pleasure. Of all this, Nîmes now houses Bréguet Atlantics of Second Generation, Nord 262s, detached Etendard IVPs and Super Etendards and the two very lone Hawkeye E-2Cs destined to be the eyes and ears of the Fleet on board of nuclear-powered carrier Charles de Gaulle. Enjoy this Good Time Oldies...with some captions.